The amphibious assault ship USS Bonhomme Richard is on its way to San Diego after docking in Sasebo, Japan, for the final time. Forward-deployed to Japan since 2012, the Bonhomme Richard has called Sasebo home for six years and has served as the flagship of Expeditionary Strike Group 7, providing a rapid-response capability for the 7th Fleet area of operations. The ship left Sasebo on Wednesday on the way to its new home port of San Diego. 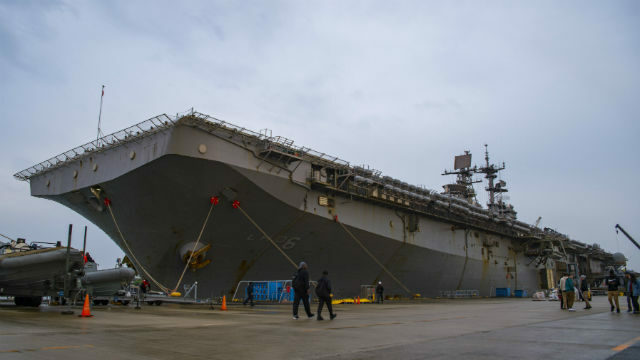 The amphibious assault ship USS Wasp will replace Bonhomme Richard as 7th Fleet’s forward-deployed amphibious assault ship. Amphibious assault ships are small aircraft carriers with helicopters, vertical-takeoff jets and landing craft to support a Marine unit.